Six years ago, for its December 2012 issue, the Harvard Business Review declared that no job would be more sought-after over the next decade than data scientist, which it called the sexiest job of the 21st century. With more than half the decade gone, it seems Harvard’s bold predictions were warranted. Search volume for the term “data scientist” has soared 675 percent since December 2012. Glassdoor deemed data scientist the best job in the U.S. in 2017 and 2016. 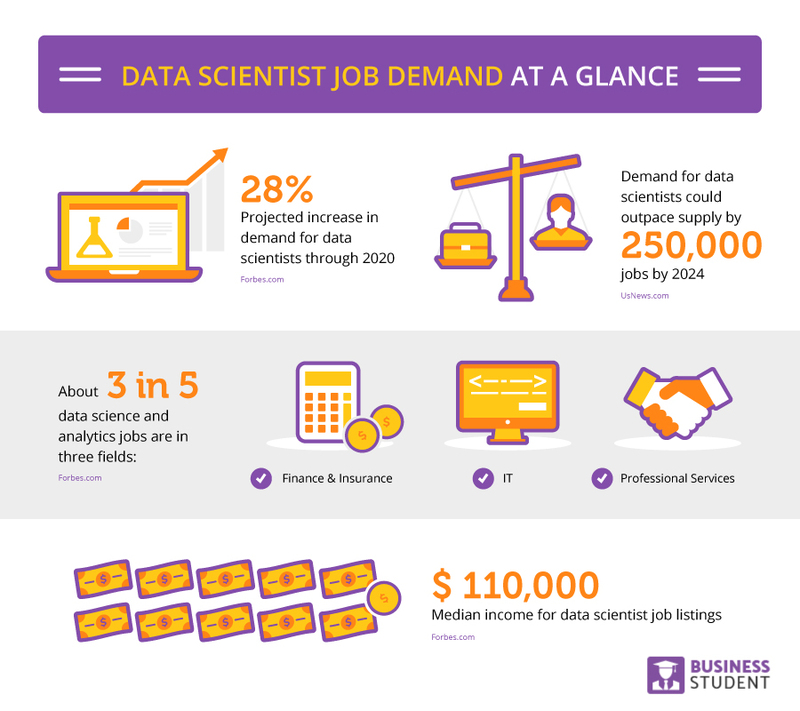 Jobs in data science and analytics are projected to grow by another 15 percent by 2020. But data scientist isn’t the only job for those with a background in data science. Let’s first take a look at what data scientists really do. Because it provides the foundation of so many technology jobs today, data science is an incredibly broad field. Data science includes many disciplines, from computer science to statistics, but essentially, data scientists take data, organize it, and then analyze it to reveal connections or intelligence to inform business or organizational decisions. An in-demand data scientist will have an analytical mind, a strong background in math, thorough knowledge of statistics and programming, and the ability to organize information. Let’s take a quick look at the education, industries, salaries, and outlook of data scientist jobs. While not always required, advanced degrees are incredibly valuable in this field, particularly if you want to move up to the higher levels of the industry. If not a degree in data science specifically, you should consider a degree in mathematics and degree in statistics, degree in engineering, or degree in computer science, as they’ll give you a good background in what you’ll need to know to become a data scientist. Also degrees in business analytics, degrees in data analytics but there are even a larger number of college degrees available to get into big data. While data science is needed in virtually every industry, including nonprofits and governments, data scientist are in heavy demand in biotechnology and pharmaceuticals, energy, transportation, telecommunications, aerospace, IT and security, finance and banking, software, media, and retail. Actually, it probably would be easier to create a list of industries where data scientists aren’t required. As with most fields, a higher degree will usually net you a more generous starting salary, but data scientists generally are paid well, with the average salary around $130,000. Demand for data scientists is high, and demand for data scientists and engineers is projected to grow by a combined 39 percent through 2020. Why Is Data Science In High Demand? Smartphones, computers, media streaming services, fitness monitors, smart appliances, social media — our lives are being turned into information that companies use to learn more about us, whether to improve our lives or just sell us stuff. By 2020, the average human will generate 1.7 megabytes of data every second of the day. More data was produced in 2017 than in the previous 5,000 years of human history combined. Three-hundred hours of video are uploaded to YouTube every minute, and more than 1 trillion Google searches are done each year. But despite, or perhaps because of, the sheer amount of data out there, less than 1 percent of it will actually be analyzed. But companies know that their future success likely lies in their ability to harness and take advantage of this treasure trove of information, so they turn to data scientists to control the flow of information and turn it into profit. There is tremendous potential for value in data science. Estimates say that in just one area, healthcare, the United States could save as much as $450 billion per year through insights gleaned from data science-driven analysis and programs. When you consider that this is one analysis of just one area of the economy, data science can power intelligence that can streamline and improve the bottom line for nearly every kind of business. A strong foundation in data science and experience with the tools we discussed should equip you with the ability to get a job in whatever industry interests you. But here’s a look at 10 interesting job openings we found during our research, whether these are jobs we expect to be in high demand or they’re just plain cool. The salary ranges and hiring companies came from research on Indeed, Glassdoor, and other job boards. The lack of ethnic and gender diversity in STEM fields has been well-publicized, and the situation is no different when you drill down into data science as a specialty. Women, African-Americans, and Hispanics and Latinos, in particular, are underrepresented in data science. Women make up just over a quarter of data professionals despite making up nearly half of the overall American workforce, African-Americans make up about 11 percent of the U.S. workforce but only 9 percent of STEM workers, and Hispanics and Latinos comprise about 16 percent of the workforce but just 7 percent of STEM employees. One ethnic group, Asians, is overrepresented in STEM, making up 6 percent of the overall workforce but 13 percent of STEM workers. The past 25 years have seen improvements in diversity among STEM workers, as representation by women and ethnic minorities has increased since 1990, but the fact that these groups lag behind in these potentially lucrative jobs means a huge percentage of the population lacks access to the wealth these jobs can help them build. After all, STEM-focused workers tend to earn more than non-STEM workers, even when accounting for educational differences. Salaries in STEM fields have long outpaced others, and that divide has grown in recent years. Today, workers 25 and older with bachelor’s degrees earn an average of about $55,000; for those in STEM fields of the same age and educational attainment, the average earnings are about $75,000. In 1990, the overall gap between non-STEM and STEM workers was 40 percent; today it’s an incredible 65 percent. Relegating African-Americans, Hispanics and Latinos, and women to non-STEM fields increases the chances that they will be taking lower-wage jobs despite having similar education as their STEM-employed male counterparts. A problem this large can’t be solved overnight, but schools, universities, and employers should take active measures to combat the lack of gender and ethnic diversity among their classes and offices. Those could include intervention among elementary-age students, integration with arts and humanities disciplines, or including social justice aspects in STEM education (after all, the point of STEM is making life better, right?). STEM workers, including those with a data science background, are among the most in-demand and highest paid in the U.S. workforce. And a job in data science doesn’t have to mean something that’s boring or will make you go blind staring at Excel spreadsheets (though if you’re into spreadsheets, you’ll deal with them plenty). With advancements in technology and an onslaught of data that grows by the minute, data science degree-holders are incredibly well-positioned to find jobs in a wide range of industries with varying (and potentially fun) job duties.